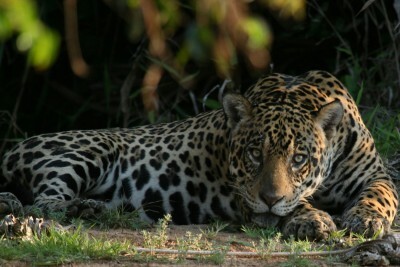 The SouthWild Jaguar Flotel and Suites is focused on securing reliable and quality jaguar sightings for all its guests. Over many years of jaguar watching operations, SouthWild’s accommodation has shifted between a series of tented camps and large houseboats to the current setup. 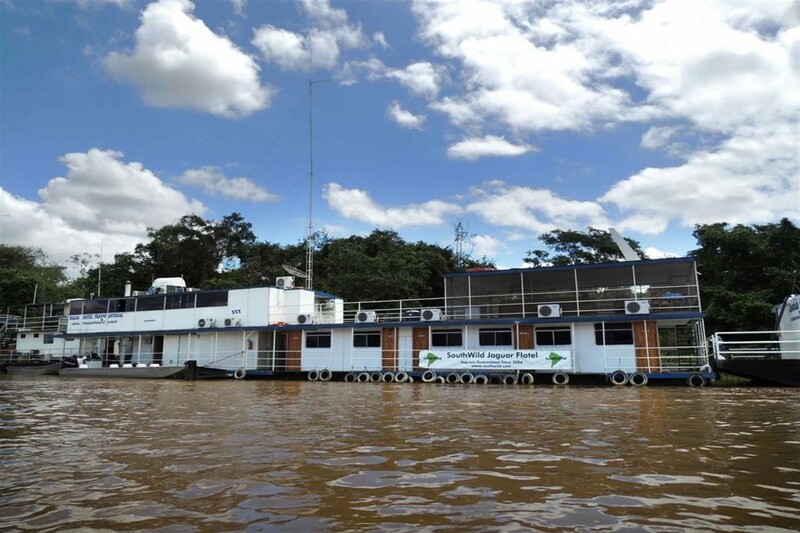 From 2014 their jaguar watching has been operating from two houseboats, moored close to the confluence of the Cuiaba and Three Brothers Rivers. The houseboats have 18 small, air-conditioned en suite cabins with hot water showers and two single lower berth beds. 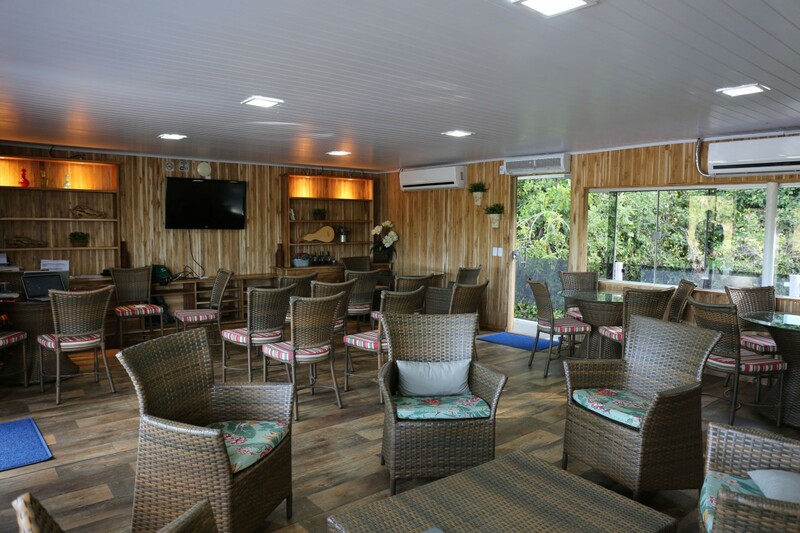 There is also a large air-conditioned lounge/dining room and partially covered top deck with hammocks and seating. New since 2014 are 6 en suite floating suites located 5 metres upstream from the current Jaguar Houseboat and connected by a 5-metre long bridge near water level. Each of the 6 guest rooms in the Jaguar Suites boasts more than 30 square metres of well-designed space and includes a flow-through, quiet “exhaustor” fan; split air conditioning; free Wi-Fi internet; two oversized twin beds (1.28 metres wide); ample table and shelf space; lots of electrical plugs for charging cameras and laptops and private river views. Meals will be taken in the main houseboat dining room. Jaguars have historically been one of the most difficult of the big cats to see in the wild with sightings often restricted to brief glimpses in the remote rainforests of Latin America. 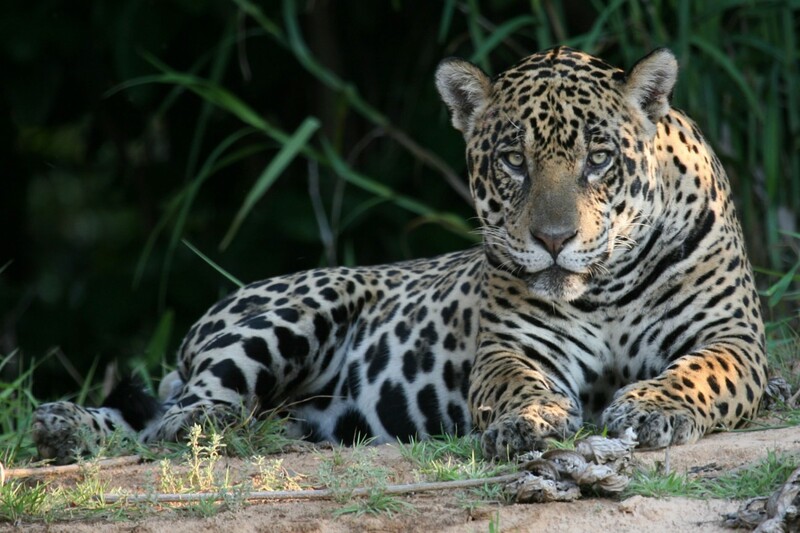 However, over the years, the camps have been located in an area of Brazil’s Pantanal where jaguars are found in very high numbers and are seemingly very comfortable with human presence. Since 2007, Reef and Rainforest clients have seen over 350 jaguars whilst staying at the camps, with a 100% success rate from 2010 to 2013 – a real testament to the effort put in to find this apex predator. Some sightings have been brief whereas others have lasted for hours, with many visitors returning with hundreds of photos and hours of video of rarely seen behaviour such as hunting, swimming, mating and territorial fights. Key to the jaguar camp’s success is having all boats linked by radio and scouring different areas of the riverbank. They aim to have three boats searching for jaguars for at least five hours each day, with scout boats used to make up numbers when there are fewer guest boats. SouthWild Jaguar Flotel and Suites will undoubtedly continue to offer the best chance of observing jaguars anywhere in the world. As with all wildlife sightings, there is a large element of luck involved and factors such as weather can limit the number and quality of sightings. 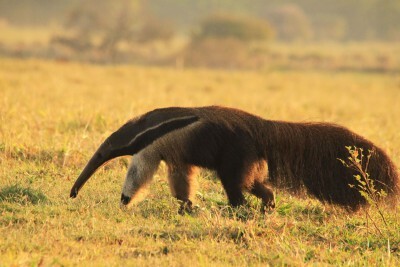 Whilst searching for jaguars there is plenty of time to see many of the Pantanal’s other great wildlife highlights such as capybaras, caiman, giant and neotropical otters, various species of monkeys and a huge number of birds, including three species of stork. 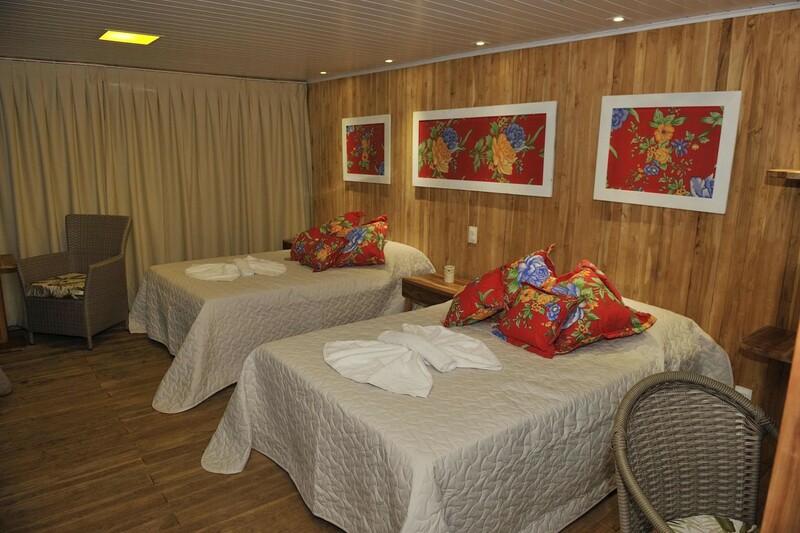 18 simple, twin, en suite, air-conditioned cabins with single lower berths and hot showers, large air-conditioned lounge/dining room with picture windows, and partially covered top deck with hammocks and seating; 6 spacious suites with large picture windows. The best viewing opportunities for jaguars and giant otters in the world. Neotropical otters, Brazilian tapirs, black howler monkeys, black-striped capuchins, various water birds, and plentiful capybara. Jaguar watching by small boat along the rivers. 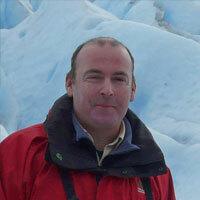 At a higher cost a private guide and boat can be arranged. 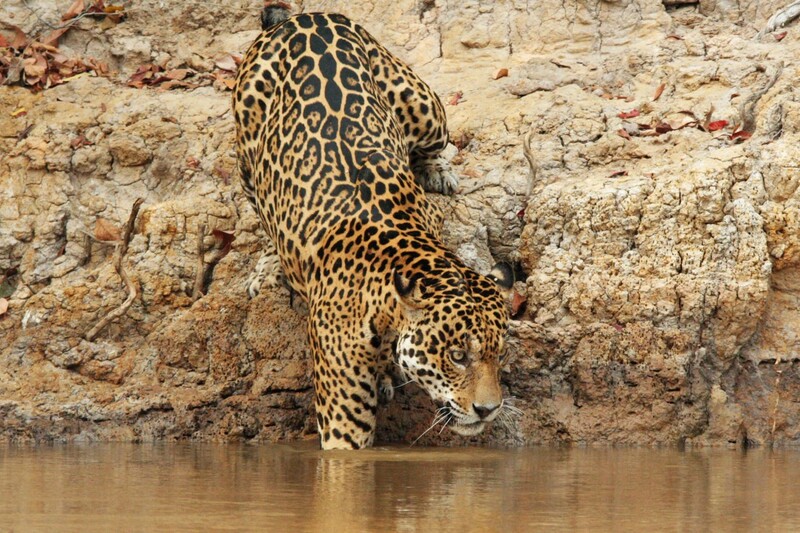 Best sightings of jaguars are during the long dry season from June to October. 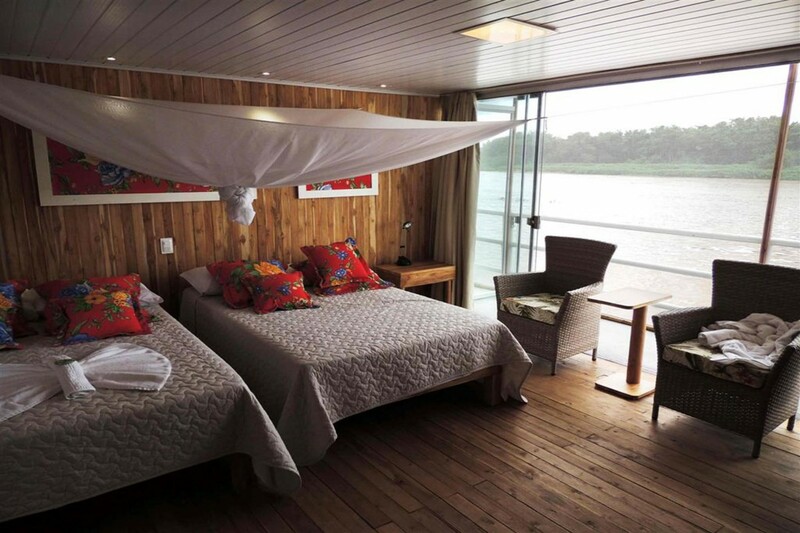 An upgrade to the Jaguar Suites, which are located on a separate houseboat and are much more spacious, is possible. The flotel is a great location for the river trips. We had a river facing room - food was good, service excellent, and the evening presentations very interesting.